An Amazing Thailand blog featuring travel tips and insider information about popular destinations and hidden treasures in Thailand. Kao Jai means “understanding” in Thai – literally, to “enter the heart”... so join me as I journey through my favourite travel destination and spiritual homeland. Dear loyal readers, Kao Jai Thailand is no more ... but please check out my new blog, Thai Travel Tales, which is basically the same thing but rebranded under a more searchable name and with a gorgeous new design! Thanks for reading my ramblings over the past few years, please keep following my new Amazing Thailand blog. Over the past two years, I've been very proud to have presented Kao Jai Thailand in conjunction with Tourism of Authority of Thailand (Australia). It's given me the opportunity to explore wonderful and intriguing corners of Thailand and to probe into details which I might otherwise have been missed. And it seems that my blog has struck a chord with readers all over the world too! I often get comments from wide and far about my posts, which I totally appreciate - feedback is fantastic, especially such positive words. During these two years I have been privileged to post articles by other brilliant travel writers with a connection to Thailand, especially John Borthwick, Oliver Benjamin, Cynthia Barnes, Roderick Eime and Kerry van der Jagt. Your contributions have been invaluable, especially last year when I was unable to travel to Thailand as often as I'd like. But now I'm saying sawasdee ka to Kao Jao Thailand; and welcoming my brand new blog, Thai Travel Tales. The whole idea is to rebrand with a more generic, searchable name, one that is more easily found on Google ... with the aim of building my readership! However, it will be same same but different - different look, but the same great content about destinations, activities, travel tips and cultural curiosities in Thailand. My brilliant team of writers will continue to inform and entertain you, just under a new blog name. So please look out for it - kickoff will be early next week. Thanks again for reading this blog, and please like, befriend, join and share my new blog!! Regular contributor John Borthwick samples, in alphabetical order, Bangkok’s various public transports of delight and sometimes despair. 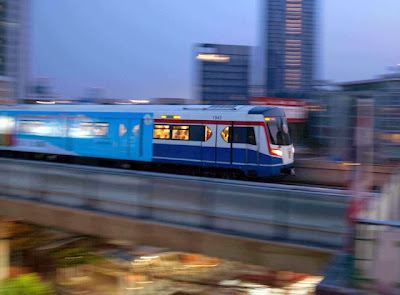 Airport Rail Link From Suvarnabhumi (pronounced Suwannapoom — or “Swampy”) to midtown takes 30 minutes (and 45 baht) on the eight-stop City Line, and about 20 minutes (and 90 baht) on the one-stop Express Train. Both terminate at Phaya Thai BTS SkyTrain station. Excellent system. Airport Taxi Exit on the ground floor; locate the yellow, meter-taxi hire desk. This service costs 50 baht added to your final fare. Desk tells the driver your destination hotel/address. For example, you’re going to Sukhumvit Road: the meter starts at 35 baht, you pay road tolls as you go (45 and 25 baht) and the final meter fare (about 250 baht), plus 50 baht service fee. Tip if you want. Bus Cheap, often crowded, non-airconditioned. Signage in Thai. Drivers rarely speak English. Unless you know exactly where you want to go (and have it written in Thai), this is not the easiest choice for visitors. Canal Boat Fast, furious and spray, too. Skinny canal boats rocket along the 1837-built Saen Saeb klong, making fleeting pit-stops at 18 wharves. You leap on and off — literally — wherever you want. The conductor collects fares on-board. A cheap as chips tour of Bangkok’s backdoors. Motorcycle Taxi Non-PC masochism. “Moto-si” dudes linger on corners wearing numbered, low-visibility vests. Explain your destination. Settle on the fare first — prices start at about 40 baht for a short trip. Be sure to use the helmet. 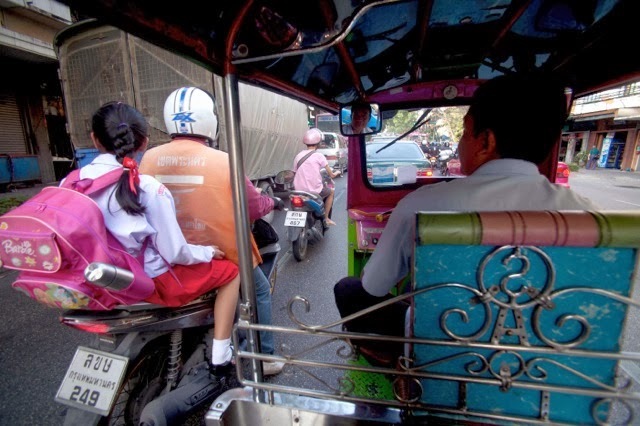 Settle back for a slipstreaming, tailgating, maximum monoxide view of the Bangkok stampede. MRT Metropolitan Rapid Transit system aka the subway. A limited network (18 stations, one line), but clean, fast and economical. Purchase a token before boarding. River Ferry There are two principal ferry systems. 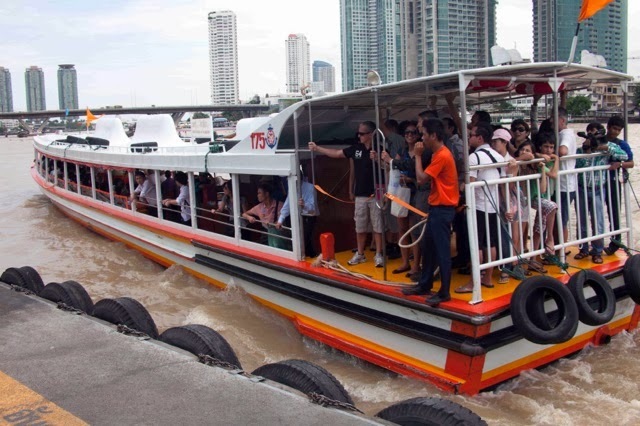 The Chao Phraya River Express is a local service that’s quick, crowded and cheap. It services numerous whistle-stop wharves — a commuter bus on water. The recommended Chao Phraya Tourist Boat is more comfortable and stops at 30 piers near main visitor attractions — a one-day pass costs 150 baht. Starting point is Central Pier (at Saphan Taksin Bridge). SkyTrain (BTS) The Bangkok Train system, aka SkyTrain, is more extensive than the MRT and runs (as the name suggests) well above ground. Some 33 stations on two lines. Before boarding, purchase your ticket card (15 to 52 baht, depending on distance) or a 130-baht One-Day Pass. Clean and air-conditioned, though often SRO crowded. Always beats road traffic. Taxi BKK meter taxis are plentiful, clean and inexpensive. Many drivers speak little English (and some don’t know this extensive city very well) so it helps to have your destination address written in Thai. Make sure the meter is on (flag-fall, 35 baht); if the driver won’t use the meter, just hop out and hire the next cab — which is about one minute away. Tuk-tuk These days tuk-tuk (proper name samlor, “three-wheel”) is a novelty transport mostly used by tourists. Tuk-tuks are unmetered and drivers will charge farang whatever they think our (often demonstrated) ignorance will bear. Always more expensive than a meter taxi. Never start your journey without agreeing on the price and if there’s more than one passenger, do not pay “per head.” PS: Don’t get taken to gift shops, etc, “just for quick look”. Walking BKK footpaths can be wondrous, infuriating, alienated zones of stalls, utility boxes, merchandise, excavations, pitfalls, fortune-tellers, food carts and random roadblocks, more resembling a steeplechase than a sidewalk. You won’t get anywhere fast, but you’ll see plenty and often out-walk a Sukhumvit-Silom traffic jam. Needless to say, I loved this hotel, from its exquisite design and decor to its tranquil location on the riverfront. The Siam is the love-child of one of Thailand's most famous celebrities, Kriss Sukosol Clapp. A handsome rock star and actor, Kriss is a member of the famous Sukusol family - an all-singing, all-entertaining hotelier family who could be called Thailand's version of the Von Trapps! I had the pleasure to dine with the matriarch of the family, Kamala, and her charming daughter, Marisa, during a recent visit to Sydney. Kamala - donning classic '60s beehive and painted eyebrows - jokingly calls herself a "one hit wonder" due to the success of her most famous song, 'Live and Learn' in 2003. 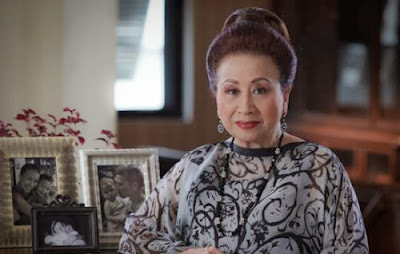 During the lunch, she entertained us with stories of performing all over the world, as well as leaving me green with envy discussing her antique collection, including priceless Chinese ceramics. She was also gracious enough to present me with a recent CD called "New York New York" featuring hit songs about ... you guessed it - New York. Daughter Marisa introduced herself to me as "the voice of Snow White" in the Thai version of the Disney cartoon, trilling a bird-like "la la la la" to prove her point. I almost saw animated butterflies and bluebirds circling around her head, honestly! 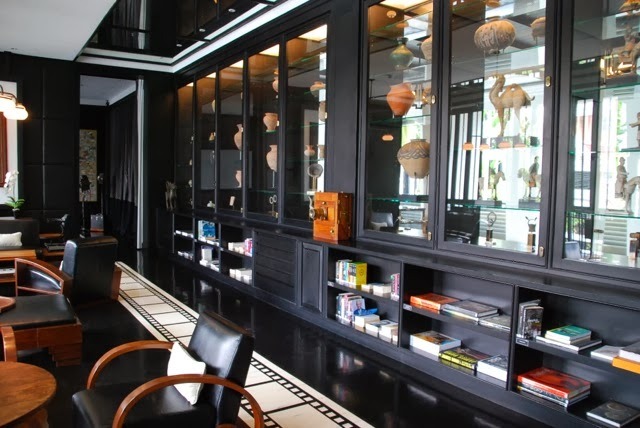 Kamala's antique collection sits alongside son Kriss' own personal Aladdin's Cave of art deco delights in the corridors and guest rooms of The Siam. 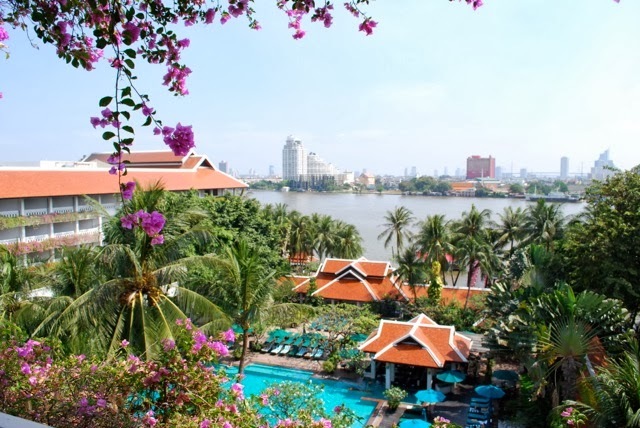 The hotel is built on prime riverside land owned by the family since 1973 - it had previously been used as a private pier for boat excursions along the Chao Phraya River. At one point, it was also leased out to a seafood restaurant. 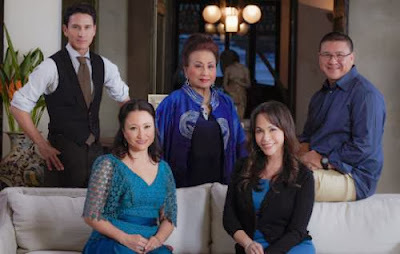 When Kriss inherited the land in 2005, he decided to fulfil his dream of opening a boutique hotel where he could house his extensive antique collection. His vision was brought to fruition thanks to the genius of wonder-designer, Bill Bensley, who shares the family's love of history and quirky antiques. This is a gem of a hotel - well worth a visit, even just for a poke around! Bangkok - the gateway to the Land of Smiles. It's big, bold, brash and vibrant. It's a city of chaos, insane traffic and crowded streets. It's also brimming with history, allure and mystery. The food is totally awesome. 1. 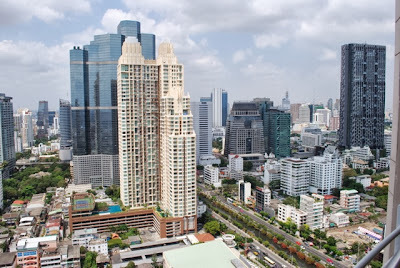 SHOPPING Bangkok is one of the world’s great shopping cities, with bargain prices, endless variety, easy access, long opening hours and an ever-growing collection of air-conditioned shopping malls creating the perfect storm for a shopping frenzy. Most tourists make a beeline for MBK, where 2000 market-like shops sell everything from suitcases to DVD rip-offs, fashion, shoes and accessories, with bargaining part of the fun. 2. ROOFTOP BARS In the City of Angels, what better way to drink in views on a balmy evening than from a skyscraper rooftop? 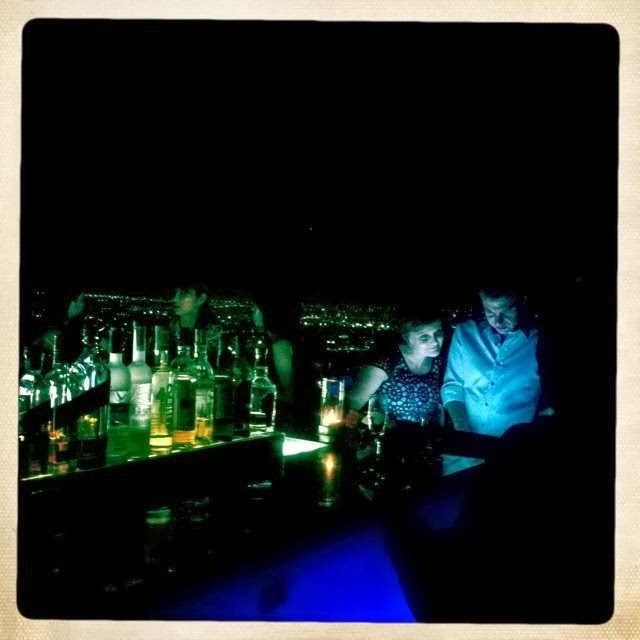 Featured in The Hangover Part II, the iconic Sky Bar atop Lebua State Tower is the world’s highest outdoor bar with stunning vistas across Chao Phraya River, while the aptly named Vertigo restaurant and Moon Bar on the 61st floor of the Banyan Tree Hotel is a stunningly beautiful and incredibly hip venue. 3. STREET FOOD When Bangkok locals aren’t shopping, they are eating, and doing it with voracity. Every evening, the footpaths become pop-up dining rooms as locals pull up a plastic chair, grab a Singha beer and tuck into tasty meals whipped up by street vendors. It’s cheap, social and delicious, with the general rules of thumb for any street food applying: if it’s cooked fresh, it should be fine. 4. NAHM Acclaimed Australian chef David Thompson has taken the concept of traditional Thai street food and turned it into art, with his restaurant Nahm considered one of the best Asian restaurants in the world. And delectable the food is, with explosions of taste, a subtle balance of flavours and a sophisticated elegance, all served share-style in traditional Thai manner. It costs a little more than traditional street food – 1800 baht ($60) for a set menu, or mains around 400-600 baht. See comohotels.com/metropolitan bangkok/dining/nahm. 5. CHAO PHRAYA RIVER The broad, muddy Chao Phraya is the heart and soul of Bangkok, a working river that’s shaped the city’s history and economics. Escaping from the choking streets on to this languid artery is sweet relief, with ferry trips to sights such as the Grand Palace and Wat Arun (Temple of the Dawn) providing the best and quickest form of transportation. Watch heavily laden barges float by from riverside restaurants or on a dinner cruise, or linger longer at a peaceful riverside hotel. 6. GRAND PALACE This glistening homage to the kings of Siam comprises several eclectic buildings, pavilions and gardens in four main courts. The complex includes the Temple of the Emerald Buddha (housing Thailand’s most sacred Buddha image), royal offices, museums, ceremonials halls and the former residence of the cosmopolitan King RamaV. Since this is a religious site, visitors must be appropriately dressed, with no singlet tops, bare shoulders, exposed thighs, sweat pants or pyjamas allowed. Seriously. See grandpalacebangkok.com. 7. WAT PHO Located just behind the Grand Palace, this working temple is famous for its reclining Buddha, measuring 46 metres long and 15 metres high, just one of more than 1000 buddhas on display. The massive, serene-faced gilt image is seemingly squeezed into its resting place, head grazing the ceiling, while its feet alone are five metres long. The temple is also considered the first public university in Thailand and the birthplace of traditional Thai massage, with an operating school offering massages for 420 baht an hour. See watphomassage.com. 8. JIM THOMPSON HOUSE In 1967, American entrepreneur Jim Thompson disappeared into the jungles of Malaysia and was never seen again. As the man who had single-handedly reinvented the Thai silk industry in post-war Bangkok, his legacy was enormous, witnessed by the ubiquitous silk shops bearing his name today. A man of exquisite taste, Thompson’s teak house – called ‘‘the talk of the town” and “the city’s most celebrated social centre” during the late 1950s/early ’60s – is a rare example of traditional Thai architecture as well as a museum of antique Asian treasures collected during his lifetime. Seejimthompsonhouse.com. 9. CHATUCHAK MARKET Located in Bangkok’s north but easily accessed by Skytrain, this weekend market is one of the world’s largest, covering 6.8 hectares. While it can be hot and overwhelming, take time to explore the 27 separate sections, discovering everything from clothes to handicrafts, homewares and antiques, even pets (and the odd endangered species, with the market often accused of being a hub for illegal trading).When it all gets too tiring, relax over a beer and street food, or stop off for a massage. See chatuchak.org. 10. PAMPERING When I’m in Thailand, I have a massage every day: why not, when they’re so cheap? Bangkok is full of legitimate massage establishments (and the other kind as well)where you can indulge in a foot or traditional Thai massage for as little as 300 baht an hour. If you are more into pampering and ambience, splash out at one of the more upmarket spa complexes, such as Rarinjinda Wellness Spa. 11. DENTISTRY Bangkok actively promotes medical tourism, with the promise of cheap dentistry luring visitors from all over the world. While many people baulk at the idea of overseas dental work, Bangkok’s clinics are top-notch, with internationally trained practitioners and state-of-the-art facilities. Major processes such as crowns, bridges and tooth removal are a fraction of the Australian price. If you don’t want to risk surgery, indulge in a clean or tooth whitening. The Tourism Authority of Thailand has several recommended clinics on their website, thailand.net.au. 12. SUKHUMVIT An exclusive district of Bangkok, full of bars, restaurants, hotels, shopping centres and condos for Western expats; but it’s in the laneways, or so is, running off this major artery where you find most of the action. Some of the numbered sois are infamous and have earned names, such as red-light Soi Cowboy (between Soi 21 and 23), packed with girly bars; while Soi 11 is a popular nightclub and restaurant zone. The area is easily accessed via the Skytrain, with Nana Station a good jumping off point. 13. CHINATOWN Amaze of alleyways flanking Charoenkrung and Yaowarat Roads, Chinatown is one of the most vibrant parts of Bangkok, oozing history and a rich cultural identity. Prepare to get lost as you wander through claustrophobic alleyways, breathing in the aroma of herbs, incense, unidentifiable seafood and curries. Glance up and discover living history behind original teak facades. A photographer’s and foodie’s delight. 14. THE KLONGS A long tail boat excursion along canals and waterways criss-crossing the Thonburi side of Chao Phraya River provides an intimate snapshot of the ‘‘real’’ Bangkok as you pass temples, waterside villages and peer into people’s backyards. A charming stop is Baan Silipan, where a 100-yearold teak house has been converted into a gallery, cafe and performance space for a traditional puppet troupe. Free performances are held every day at 2pm, bringing characters from the Ramayana to life. 15. MUAY THAI Thailand’s brutal combat sport is known as ‘‘the art of eight limbs’’, using force from fists, elbows, knees, shins and feet. To see champions of the sport in action, head to Lumpini or Ratchadamnoen Stadium for an evening of blood, gore and the bray of avid fans. Or, for amore personal appreciation of the intricacies of the sport, take a lesson: it’s actually great fun and a fantastic workout. 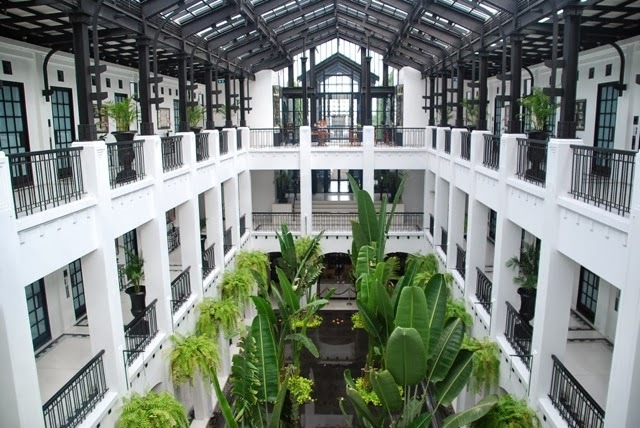 The Siam hotel boasts Bangkok’s newest state-of-the- art boxing gym, with private lessons available for guests or by arrangement. See thesiamhotel.com. 16. COOKING SCHOOLS Australians are suckers for Thai food and the opportunity to learn to cook our favourite international cuisine is an essential part of any Thailand holiday. While most hotels offer classes, there are several independent Bangkok schools where you can souvenir gourmet tricks and the odd classic recipe. Amrita Thai Cooking holds a fun, hands-on half-day course, located in a lovely riverside home with its own herb garden, and run by the charming and amusing instructor, Tam. See amritathaicooking.com. 17. LUMPINI PARK In a city of skyscrapers, shopping malls and choked streets, this rare green patch is as much a haven as Central Park for New Yorkers. Locals love to sweat it out on morning jogs or cycling excursions, while there’s something wonderfully kitsch about the Thai love of swan paddleboats, available for hire. On Sunday afternoons from December to February, grab a snack from the weekend food market, sprawl out on a hired mat (30 baht), and listen to free jazz or classical music concerts as the sun sets. 18. WEIRD MUSEUMS If your taste runs to the slightly bent, head to one of Bangkok’s museums dedicated to the bizarre. The Bangkok Corrections Museum, set in the remains of an old prison, highlights methods of torture and execution; while the Forensic Museum has a collection of body parts, organs infested with parasites and foetuses that will truly turn your stomach. Not for the fainthearted. 19. AYUTTHAYA In the valley of the Chao Phraya River, the ancient Siamese capital of Ayutthaya is arguably the best day trip from Bangkok. The World Heritage-protected ruins, once proclaimed the most magnificent city in the world, date back to 1350, with highlights including the iconic Buddha head entwined within the roots of a banyan tree at Wat Maharat, and the original elephant kraal (corral). Cycling tours are a great way of getting around, as the whole site is flat. 20. 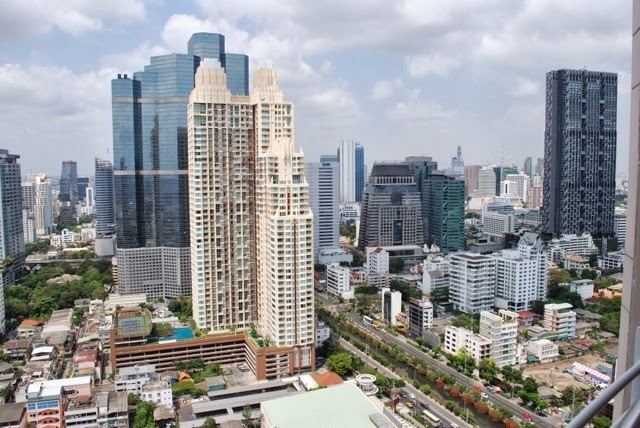 FIVE STAR LUXURY AT A BARGAIN PRICE Five-star hotels abound in Bangkok, and with competition fierce, you can get great deals on luxury digs for a fraction of the price you’ll pay elsewhere. Discounted hotel sites are advertising apartment-style accommodation for just over $100,while a room at a top-notch hotel such as Banyan Tree is selling for just over $230. Splash out, relax and enjoy. The writer was a guest of the Tourism Authority of Thailand and Banyan Tree Bangkok. On October 4, elephant lovers and conservationists will come together with a message to world governments - "Say No To Ivory". Organised by The David Sheldrick Wildlife Trust, the iWorry International March for Elephants will take place in 15 locations around the globe, including Melbourne in Australia and Bangkok in Thailand. The march aims to highlight the issue of the illegal wildlife trade, and to spread the message that elephants are being poached to extinction for their ivory. Last year, up to 36,000 elephants were killed for their ivory. That's one life lost every 15 minutes. At the current rate of poaching, African Elephants could face extinction in the wild by 2025. The situation is also dire for Asian Elephants, who face an uncertain future in ever-decreasing wilderness preserves where poaching is a very real problem. The Melbourne March begins at Federation Square at 12.30pm. Regular contributor John Borthwick visits an on-song Andaman alternative to Phuket. Long, unsullied beaches. No jets-skis, sun-loungers or tuk-tuk mafia. Take me there! Laid-back Khao Lak, in Phang Nga Province on Thailand’s Andaman shore, is the place. Its 25-km string of beaches still looks much as it did a decade ago — a slumbering coastline of palms, sea-pines and low-rise resorts. This languid shore has always been a favourite with long-stay northern Europeans, with its discrete, upmarket resorts (none built higher than a coconut tree) catering for those who want to get away from all the others who are getting away from it all. The tsunami of Boxing Day 2004 hammered Khao Lak hard, with some 4000 people perishing. The subsequent rebuild was well planned and the result might be described as business as unusual. That is, the locals have kept their sands free of the grids of rent-a-chairs that often bedevil Thai resort beaches. Even better, they’ve also ensured there are no off-song banana boats, howling jet-skis or tow-kite speedboats. Bang La On (often known as Khao Lak Town) on the highway at the south end of the Khao Lak coast is an ever-stretching ribbon development of mini-marts, tailors (“Johnny Armani” and co.), dive centres and restaurants, plus souvenir shops that sell “same-same-not-different” tat, albeit at wildly varying prices. Bang Niang, further up the highway, is where most of the limited nightlife happens, with bars, restaurants and a few clubs. My favourite eating place here is Blue Mist restaurant, a rambling wooden structure on the beach (near the JW Marriott), where we feast grandly on Thai seafood, chicken and vegetable dishes, plus cocktails. Over-stuffed and chuckling for 350 baht ($12) a head. This family-friendly, snoozy, honeymooning sort of coast is known as the Gateway to the Andaman. Be sure to step through that gate at least once. Take a daytrip (or longer) to either Koh Similan or Koh Surin mini-archipelago, both marine national parks, that sit just 60 km offshore. There is superb snorkelling and diving at each, with dramatic swim-throughs, prolific marine life and stunning visibility. The islands are open November to May, but closed during monsoon season. Meanwhile, inland, are five national parks, including the great rainforests of Khao Lak and Khao Sok parks. The latter is like a freshwater version of Phang Nga Bay to the south, near Phuket. Its giant Ratchaprapha reservoir is the liquid jewel of Khao Sok and one of Thailand’s under-sung wonders. Next day we’re on the Klong Sok River aboard lazy kayaks. Enormously high trees ripple above us — can you get reverse vertigo from looking upwards? The river is silent, the paddles too, and at times we round a bend to spot an electric-blue kingfisher. Or a viper snoozing peacefully on an overhanging limb, which is exactly where we leave it. I've been a regular visitor to Thailand since 2006, when I first fell under the spell of the country during a journalist famil to the annual elephant polo tournament. During my five-year obsession with Thailand, I have developed a deep appreciation of the intricacies of the country, from its warm-hearted people to its quirky and adorable animals, from its fantastic food to the awesome nightlife. A lover of both beaches and mountains, I've discovered the best of both worlds in Thailand, and split my time between the jungles of the north and the beautiful sandy bays of the south. But there is still so much of this country to uncover – and I invite you to share my experiences as I visit new destinations and broaden my knowledge of old favourites. 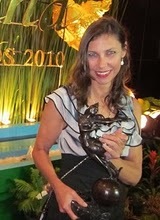 In 2010, I was awarded a coveted Friends of Thailand Award for services promoting tourism to Thailand through my travel journalism. I'm proud to further my association with the Thailand travel industry through this blog. Julie Miller 2011. Watermark theme. Powered by Blogger.